In an increasing effort to appreciate rather than acquire objects, I snapped a photo of this unusual, square ceramic trivet I found in an antique store instead of bringing it home. 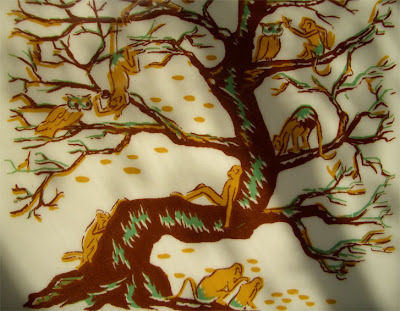 It combines two popular motifs not usually seen in tandem: monkeys and owls! Or rather, monkeys messing with owls. I'd love to know who the unknown artist is behind this loose and wonderful illustration. This porcelain trivet was only $1.50 and, dang it, I shoulda just bought it.